Spring usually reveals itself subtly, here in the mountains. We don’t see it explode like on the west side of the state where Cherry Blossoms, Trilliums, Daffodils, and such have been showing off their colors for the last few weeks. No, spring’s approach here is usually quiet, hiding under the remaining snow drifts and frosty nights. But there are some signs if you know where to look. The call of the geese as they fly over, it’s still light out at 5:00pm, and of course, there is the upcoming Daylight Savings Time. DST is not just a good time to change your clock or check your smoke alarms; it’s also a great time to start planning your trips for summer. Everyone wants to make the most of their vacation time and nothing is more disappointing than getting to your destination to find the things you were looking forward to doing are not available or that there is an event that you REALLY want to go to…just it’s next week. While there never is enough time to do it all, knowing what your options are can help you plan so you can do MOST of it. The next few blog entries will be dedicated to providing you information concerning, local attractions, events, travel routes, and amenity options to help you plan. 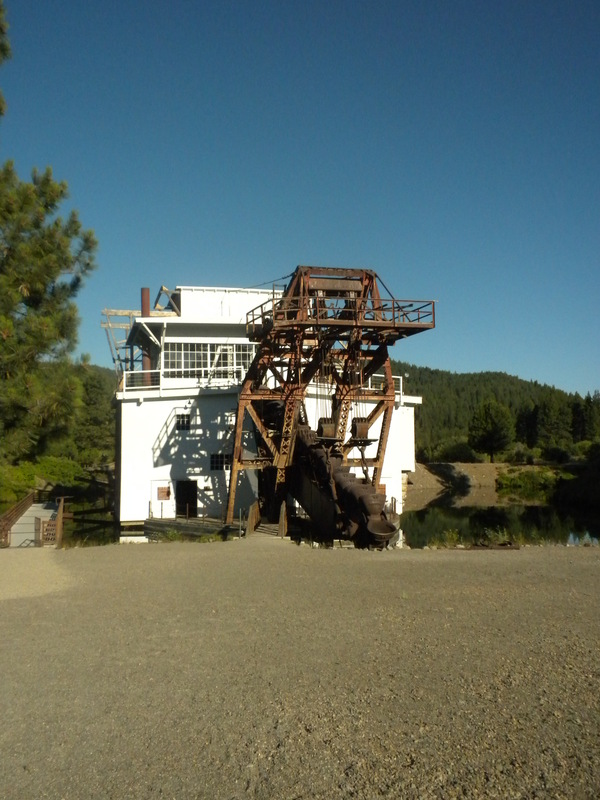 Let’s start with RIGHT HERE: Sumpter Valley Dredge State Park. The park is currently closed, but unless winter decides to dump 3’ of snow on April 30th, we will be open May 1st. The park is open daily from 8:00 AM to 7:00PM. We close the gate at night so if you’d like to stay and explore the trails after dusk or watch the stars come out by the Dredge, please be sure your vehicle is outside of the park before 7:00 PM. The Dredge is open from 8:00 AM to 4:30 PM daily. Weekdays, visitors are welcome to access the dredge on their own. Interpretive panels inside the dredge and on the trail around the dredge pond tell about how the dredge moved, worked, and how it got here. On the weekend, you have the option of a guided tour, going through on your own, or just picking the brain of the closest park ranger. Tours are scheduled between 10:00 AM and 2:00 PM. We will post the Tour Schedule on the Blog and Friends of the Dredge Website at the beginning of the season. Gold panning is also available in the park. 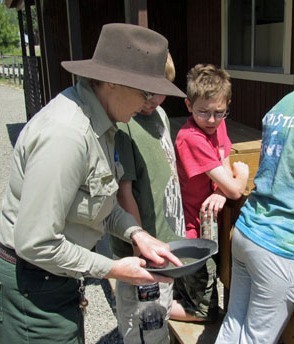 By obtaining a free gold panning permit from the interpretive center, you will be able to try your hand at gold panning at the designated gold panning sites along the river. (This park ranger would strongly recommend that folks would consider waiting till July or August to pan in the river as the water is very cold, deep, and fast.) Not sure where to start with gold panning? On weekends we offer free lessons behind the interpretive store between 10:00 AM and 2:00 PM. 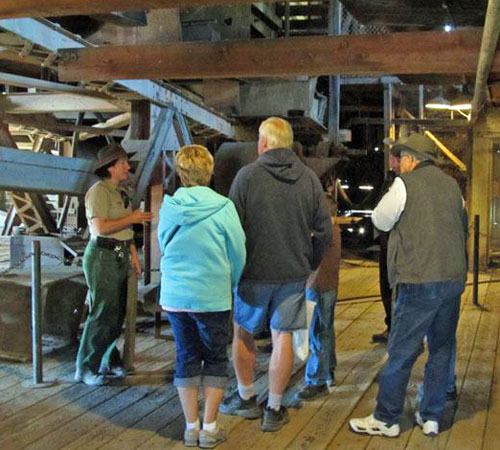 If you are planning on bringing a large group to the park for a tour and gold panning we can help you make your plans, but please be aware that it is VERY important to schedule with us in advance. Because of limited staffing during the week, we cannot guarantee someone will be available for your group if we do not know you are coming in advance. 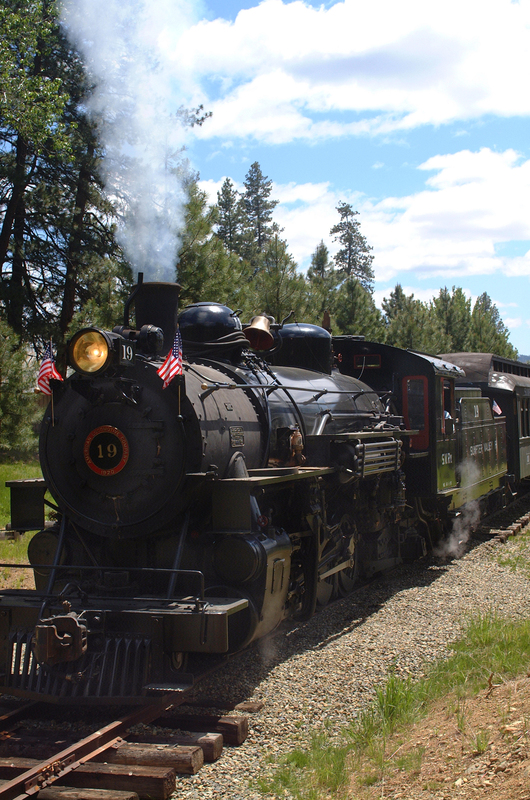 Besides that intriguing floating piece of mining machinery, known as the dredge, cool trails, and gold panning; something else also shares the park…The Sumpter Valley Railroad! Who doesn’t love trains? Well, I suppose if they ran right by your house… Yes, the track for the historic, narrow-gauge steam engine ends right in our park. The train only runs on weekends but that works out perfect to plan a tour, gold planning lessons, AND a ride on the train. Schedules and Fares can be viewed at the Sumpter Valley Railroads new website: sumptervalleyrailroad.org . So, that covers the basic. Stay tuned for the next blog to cover upcoming events and activities. This entry was posted in Dredge Tours, Gold Panning, Gold Panning Lessons, Sumpter Valley Railway, Trip Planning and tagged Beginning of the Season, Dredge Tours, Gold Panning, Gold Panning Lessons, Park Hours, Sumpter Valley Railroad, Tour Groups, Trip Planning. Bookmark the permalink. Wow, that sounds great! We’ll come for a visit….wait, we live here. I guess the next best thing to snowshoeing in the park is to look forward to spring! Okay, see you on opening day! Definitely! But you know you’re welcome to come hike the trails anytime before opening. Anyone can park in town and walk in, just be careful of ice and deep snow. Thanks Miranda! We’ll tell all our friends about how fun it is to explore the trails that wind through the State Park and how great it is to experience life in the park as everything wakes up! See you on the trails!